Slow Sunday Stitching with Kathy at Kathy's Quilts. After a long time without hand quilting, I decided to hand quilt the Windmill baby quilt for my grandson. The last time I did so was for the Four Patch Quilt few years ago. Today I will try quilting with large stitches, which is not so easy for me because when I started quilting I learnt that the most tiny stitches the most beautiful and valuable! Large stitches give a different style, maybe more actual, but the difficulty is to make even stitches. Wishing a happy relaxing stitching Sunday to all my friends! It's a lovely quilt Christine. I find it look peaceful maybe because of the shades. Anyway, enjoy the relaxing session of quilting. I'm looking forward to seeing this one when it's done. Quite modern looking so it will be interesting to see how it looks with hand quilting. I'm guessing it will be great. You are so right it is much harder to get nice even stitches but it does look wonderful! Lovely colours Christine. Enjoy your Sunday stitching. 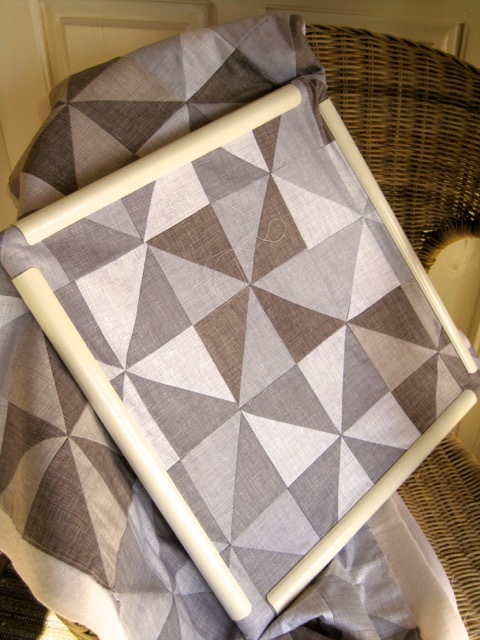 It looks like you are quilting on linen... such beautiful looking fabric! 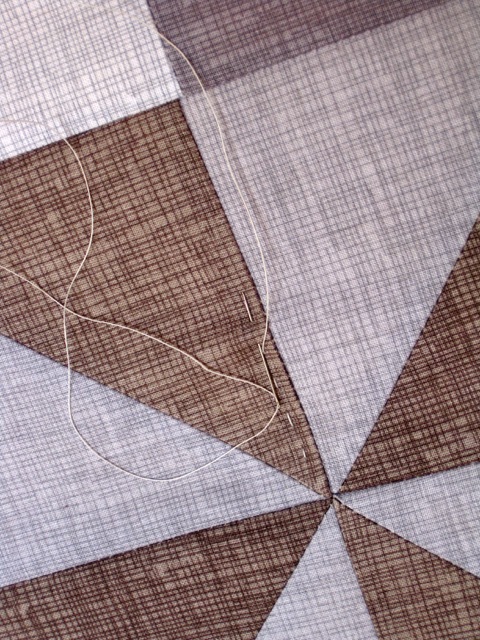 I could be wrong but if you are doing large stitches...use a longer needle not the usual short quilting needle. I have heard that this helps with the uniformity! Hand quilting will be the perfect touch for this beautiful project. 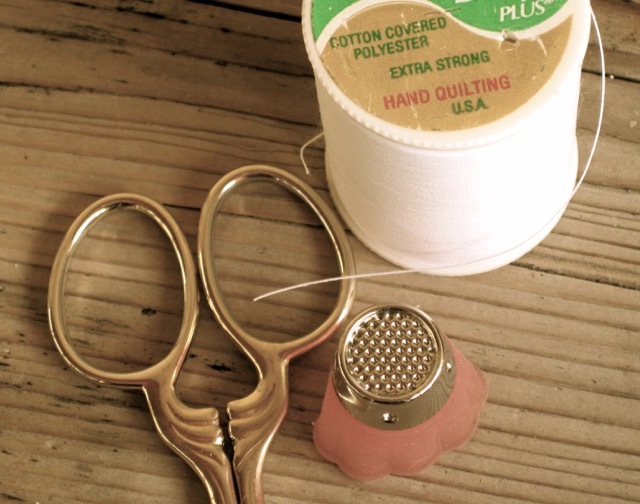 Tiger Tape makes a "Quilter's Big Stitch" guideline tape, available at Amazon. 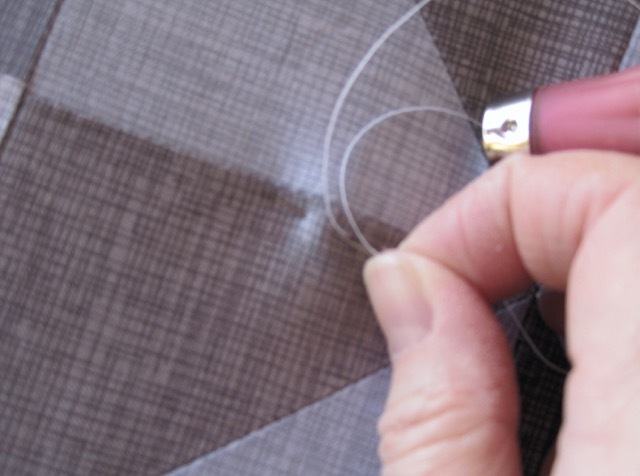 White tape 1/4" wide is printed with perfectly spaced lines to guide stitches. The tape is re-stickable a time or two. Oh, this is a great tip, thank you very much! Be careful, you might get addicted! LOL I love it now that I've been using it more. The reward is that it will go much faster than expected. Quilter à la main est, pour certaines, une relaxation !! Je suis certaine que le résultat sera à la hauteur du quilt : très beau !